September 15th, 4:00PM-7:30PM, Save the Harlem Fire Watchtower at Marcus Garvey Park, meeting at the Pelham Fritz Center at 122nd and Mount Morris Park West. 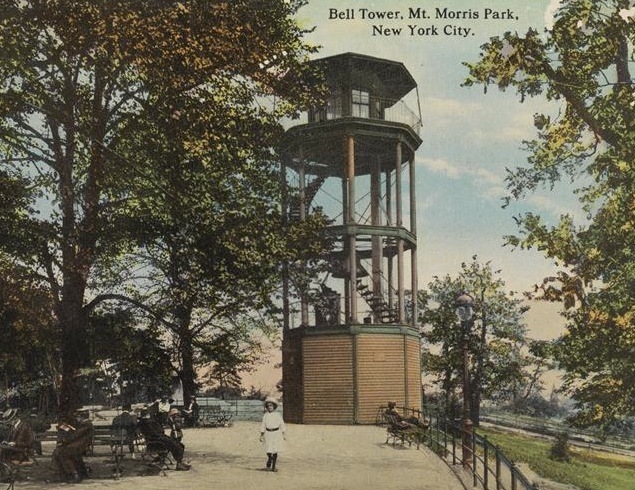 John Krawchuk, Director of Historic Preservation for NYC Dept of Parks, will share details about the various geographic and engineering studies, and financial analyses that support the restoration of the landmark watchtower in Mount Morris Park. i was up in this area of the park for the very first time just a few weeks ago. It's such a hidden gem. A successful renovation will really do wonders for the community. I would like to hear the bell ring on the hour, maybe some kind of solar powered striker. The striker mechanism protected in the little house at the top with solar panels on it’s roof. Westsider, I like that idea quite a bit. I'm up there daily. I and others run our pits up there. Before everyone goes on about 'what a hidden treasure' I suggest when and if you go up there, especially by yourself, be verY careful. I see clueless tourists and newcomers all the time and even I want to rip off their cameras and iPhones just to remind them of where they are. It gets serioUs up there at times. Anyone up for some extra info on this extraordinary piece of Harlem and New York City history? In the years before the Civil War, efforts to improve fire fighting in Manhattan resulted in the creation of a system of four watchtowers manned by bell ringers who could signal local firefighters and even more distant help via telegraph. The tower that Harlem received is the only extant example of this effort, but it was also distinctive in its own day as the earliest surviving example of cast iron construction in New York City. Julius Kroel’s 1856 design, drawing on the innovations of James Bogardus, a descendant of one of the oldest uptown Dutch families, was the winning bid. Built that same year for $2,300, it was an octagonal structure with Doric columns, its two stories reaching to 47 feet supported by a post-and-link steel cage system that would decades later be used to build the first skyscrapers. A 10,000-pound bell, cast in West Troy, New York, wasn’t installed until 1865, but by then the . watchmen on 24-hour shifts had long been ringing different patterns on smaller bells to indicate the location of fires. They also used lamps and colored flags to communicate with firefighters. The tower and bell system remained in place until the 1870s, when increasingly tall buildings and the installation of street-level call boxes that worked via telegraph made the towers obsolete. Still, Harlemites were loath to see the tower abandoned, and the bell was for years to come rung twice a day, at noon and 9 p.m. on weekdays, and at 9 a.m. and 9 p.m. on Sundays, to mark the time of day. In London I lived directly opposite a church and the bells rang every hour on the hour, it was brilliant, very atmospheric and helpful in keeping track of the time of day. Once you get used to it you can sleep through without a problem and ultimately it helps regulate life rather than disturb it.